and STOP paying for leads. Is your website designed to get you leads? Do you have the right keywords ? With the struggling economy and tighter budgets, we want to make sure that YOU are getting the most out of YOUR online presence (and budget) with a professionally-designed website built with your specific goals in mind. Get A Website That Works To Improve Your Life! We already have over 50 partners nationwide! Ready to get started, simple fill out our contact form and we will reply shortly. Don’t wait, our websites are limited to 1 partner per city. 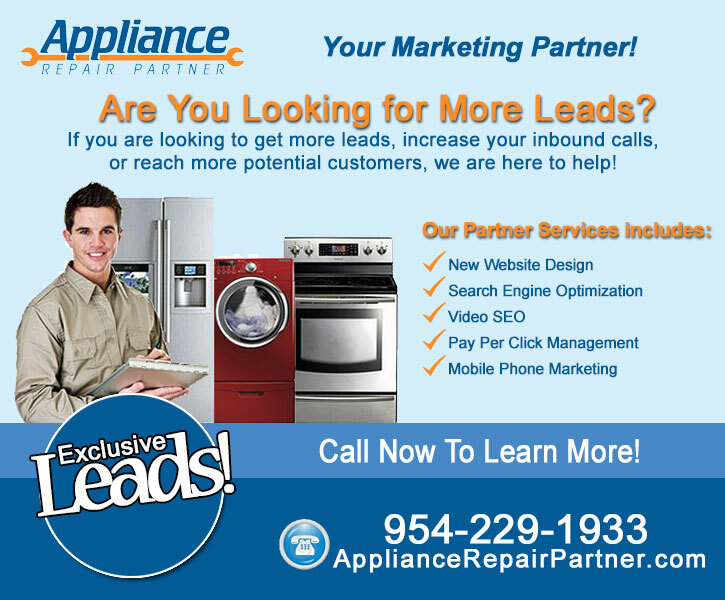 Looking for Quality Appliance Repair Leads? Advertising your appliance repair business today is changing for the better! We are marketing specialist that will put your business in the places that your customers are looking for. Places like Google, Bing and Yahoo. We specialize in appliance repair marketing that will make your phone ring. Do your Appliance Repair Marketing with a Partner! “refrigerator repair YOUR CITY”or “oven repair YOUR CITY”. Stop paying for leads...Most people today just go to the internet or their smart phone to find appliance repair professionals. Stop spending thousands of dollars a year on leads for $20, and on old school traditional advertising that is less effective and out dated. Our numbers prove it! Call to learn more. and allowing only a few lines of text to “sell” yourself, we build websites that market YOU. Our websites are built to generate leads. Our methods are proven to get you to the top of the major search engines – let us prove it to you! Are you located in any of the following cities?